Automakers dictate that you have to be punished with a boring car if you want a midsize sedan. 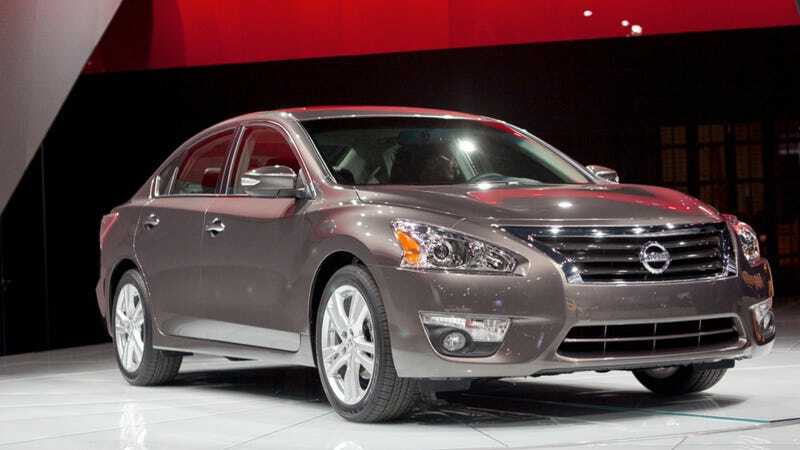 Nissan has done everything they could do to interest you with a lighter, more efficient 2013 Nissan Altima. Well, everything but change anything important. The Altima is a remarkably conventional car. It still comes with either a 182-horsepower 2.5-liter four-cylinder or a 270-horsepower 3.5-liter V6, though its dieted its way to lightest in its class with a curb weight of just 3,100 pounds. The big talking point is that the four-cylinder car manages to eke out 38 mpg on the highway. That's without any of the fancy hybrid, turbo, or direct-injection tech other companies harp about. The main development is in a new Continuously Variable Transmission, which has come a long way since the bizarre rubber band-driven DAFs of the 1960s but are still mostly terrible. The Dutch Stole the Clutch: Jalopnik Goes DAF Crazy! All we'll say about the styling is that taking inspiration from the Lexus GS and the Lexus ES is not a great way to go. Prices start at $21,500 for the base four-cylinder model, and go up to $30,800 for a top-spec V6. A base six-cylinder lists at $25,360. A Hyundai Sonata offers similarly weird styling and practically-identical 35 mpg on the highway, but costs about $2,000 less. Even with seats supposedly pilfered from the space program and a lookalike spec car in the 2013 Australian V8 Supercars season, it's pretty much impossible to get excited about this Altima.